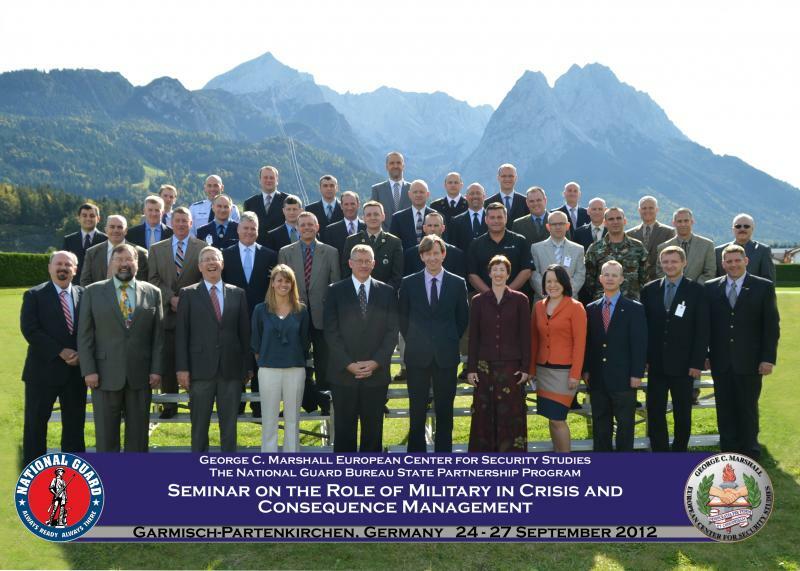 Members of the National Guard′s State Partnership Program arrived in Garmisch Partenkirchen, Germany for a workshop on the role of the military in crisis and consequence management, held on 24 – 28 September 2012. 43 people, divided in 14 teams, came together in an effort to foster increased cooperation and understanding between the countries and their state National Guard partners. As a result, the participants developed a better understanding of the challenges posed by a difficult WMD scenario. Moreover, the collaboration between the participants contributed to strengthening the personal and professional relationships between them. The teams were encouraged to preserve these relationships and to integrate the lessons learned into future partnership activities. A number of suggestions for future SPP support programs were developed. In addition to the scenario, the participants attended briefings on the emerging issues of defense support to civil authority, the DOD domestic operations policy, fundamentals of crisis management, consequence management etc. The director of the Bulgarian NATO Crisis Management for Disaster Response Center of Excellence, Colonel Professor Mitko Stoykov, Dr.Sc., also gave a presentation for the participants. The partnership states were Albania/N.J., Armenia/Kan., Azerbaijan/Okla., Bulgaria/Tenn., Croatia/Minn., Kosovo/Iowa, Latvia/Mich., Lithuania/Pa., Macedonia/Vt., Moldova/N.C., Montenegro/Maine, Poland/Ill., Slovakia/ Ind., Ukraine/Calif. The other participants included representatives from the Office of the Secretary of Defense, U.S. European Command, the National Guard Bureau, Defense Threat Reduction Agency, U.S. Army Europe, the Polish Ministry of Interior and the Bulgarian Crisis Management for Disaster Response Centre of Excellence.